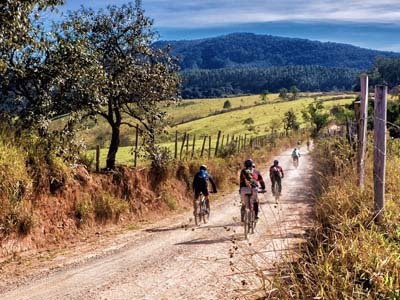 ﻿ Cycling holidays, mountain bike trails, road cycle routes and large group accommodation. The National Cycle Network (sometimes referred to as the NCN) is connected in one way or the other to almost every major town and city in the UK. More than a quite astonishing 22,500km (14,000 miles) long, it criss-crosses the entire country, and boast almost 5 million regular users. And the Forestry Commission, responsible for the country’s woodland nationally, provides over 2,500km (1,500 miles) of mixed cycle trails to enjoy. By virtue of its ease of access nationally, the NCN means cycling is the perfect pastime. And for those who want to add a social dimension by cycling in a group, be it one comprised of family or friends (or both! ), holiday accommodation in the larger holiday homes will accommodate everyone under one roof - families and big groups alike. And you don’t have to confine your cycling to the NCN either. There are plenty of quieter roads and other trails that can also be ridden along. Self guided and guided cycle routes for road cycling and off road, are found throughout UK. Large high quality holiday houses providing rental accommodation for multiple occupancy of cyclists is very popular, it eliminates the need for members of the party to have to eat or sleep in different locations away from one another. Cycle routes can be planned together, a meal and a glass of wine, all without the worry of having to load the car and drive off to a separate location at the end of a day’s cycling enjoyment. And there is no hassle regarding the timings that have a habit of otherwise seeing some of the group members clock watching because they have to travel to or from a different location. Altogether more convenient after a busy – or perhaps tiring - day’s cycling. Monsal Trail, Tissington and High Peak Trails, to Manifold Trac. Ashbourne, Parsley Hay, Derwent all make a great base for a cycling holiday and the spa town of Buxton has a great number of holiday houses suitable for big cycle groups. In Yorkshire, Leeds, Sheffield, Harrogate, or one of the popular coastal resorts: Bridlington, Scarborough, Whitby and Robin Hood's Bay are good places to stay with fantastic cycle paths around. For mountain bikers, the Lake District is a top destination with off-road trails at Grizedale and Whinlatter. Carlisle is steeped in Roman history, and the market towns of Kendal and Penrith, Ambleside, Bowness, Grasmere, Keswick and Ullswater are beautiful and if you are not waiting until the last minute you will have a great choice of holiday houses to choose from. Cycling in the New Forest is a great family activity, towns likeLyndhurst, Burley and Brockenhurst, offer trails for all standards. Not far away is Salisbury, Winchester, Southampton and Bournemouth, you'll be spoilt for choice where to go next! Rent a bike or take your bicycle? Hire bikes from local independent bike shops offering bikes from some of the best UK cycle companies (Dawes, Forme and Batri Bike) and a large range of bikes to suit riders of all standards and experience. You may require a hybrid, road bike, electric or mountain bike, just rent what you need to enjoy best cycling in the UK - there is no better way of exploring a new area at your leisure. Rental shops usually provide helmets - but you may want to pack your your own. Don't forget to ask for discounts on bike rental for multiple days hire, day and weekend rates, or deals for students and long term visitors - many cycle hire companies will offer cheaper rental rates the longer you hire the bike for, and some holiday houses with have deals with local cycle stores. Large holiday house in Norfolk near Diss with 7 bedroom, sleeps 15, No pets, Barbecue, Pub within 1 mile, Wifi, Fishing Nearby. Holiday home in Shropshire near Craven Arms with 11 bedroom, sleeps 32, Pets friendly, Pub within 1 mile, Wifi, Cot Available, Private Hot Tub. Big house to rent in Dorset near Chideock with 6 bedroom, sleeps 14, Pets friendly, Barbecue, Ground Floor Facilities, Wifi, Cot Available, Coastal Property. Vacation retreat in Somerset near Weston Super Mare with 4 bedroom, sleeps 12, Pets friendly, Barbecue, Ground Floor Facilities, Pub within 1 mile, Wifi, Cot Available, Coastal Property, Private Hot Tub.